We are the only outdoor centre licensed to operate on the Elan Estate which ensures that you benefit from a wonderfully quiet and unspoilt part of the world. You will be the only activity group at each of the locations you visit. All our activity sites are in the Elan Valley so are no more that 10 minutes drive from the Lodge. We have an AALA Licence No: L13054/R0033 valid until 15/09/2019 for the following licensable activities: Open Canoeing, Kayaking, Improvised Rafting, Rock Climbing, Abseiling, Hill Walking and Mountaineering. Other activities that we offer do not fall under the provisions of the Adventure Activities Licensing Authority however we operate these to the same standard as the licensable activities. These can be rafted together for additional stability or paddled seperately. These craft provide a chance to explore the area by water. An effective team building activity as groups of 3 or 6 have to work together to get the best out of their craft. For this activity we use double sit-on-top kayaks. These are very safe and stable, however the occasional person still falls in! These boats track straight and so allow us to explore the Caban-coch Reservoir. Design and construct an improvised raft from the barrels and poles provided, and then test your handiwork by navigating it around a short course on the lake. Both a design challenge and involving practical skills e.g. knot tying. This is an apparently simple but surprisingly complex activity. The first challenge is to listen carefully to the briefing and safety instructions. 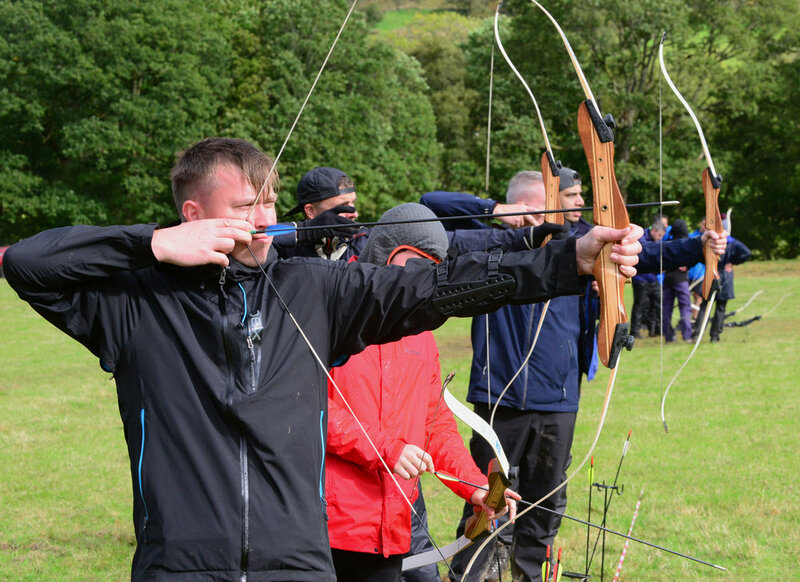 Then have a go and depending on the results, reflect on and refine your technique towards the centre of the target. On a local crag overlooking one of the reservoirs there are a number of routes offering differing levels of challenge. A high ropes course specifically designed to require and test teamwork. A series of challenges and elements set up in the trees culminating in a zip-wire descent to finish. On a local crag overlooking one of the reservoirs this activity offers a challenge to beginners and the more advanced. A number of single pitch routes are available of increasing height and difficulty. A team challenge for a small group. How high can you get one member to build the stack and stay on top? Supported by their peers this is an exciting and challenging activity that brings out the competitive side of many, but also emphasises the value of all the members of the team. Get four members of your team to the top of the pole, a challenge in itself, and then see if you can support each other whilst you all lean back! A head for heights, strong nerve and confidence in your colleagues on the safety rope all help. An often neglected activity in our action packed modern lives. This is an opportunity to get out in the wild and beautiful countryside and challenge yourself when the going gets tough. Walks from one hour to all day, local or mountains we can offer many routes, very few of them flat! Climb up a ladder onto a platform and jump off! Why would you want to do that? Personal challenge, group support, overcoming fears, confidence building to name but a few. A fun and exciting way to introduce map work and navigation. We have a number of courses of varying complexity. For some it may be their first experience of being out in the wilds without an adult directly supervising them. We have a large range of problem solving challenges at our fingertips. For teachers this is an excellent opportunity to observe your pupils in action working as a group. Different challenges focus on different aspects of team building, effective communication is always an interesting one at KS2 & 3. We can assist with all aspects of expedition training whether it be navigation, route planning, camp-craft or food preparation.